A wiki is a web site that allows collaborative editing of its content and structure by a community of users. 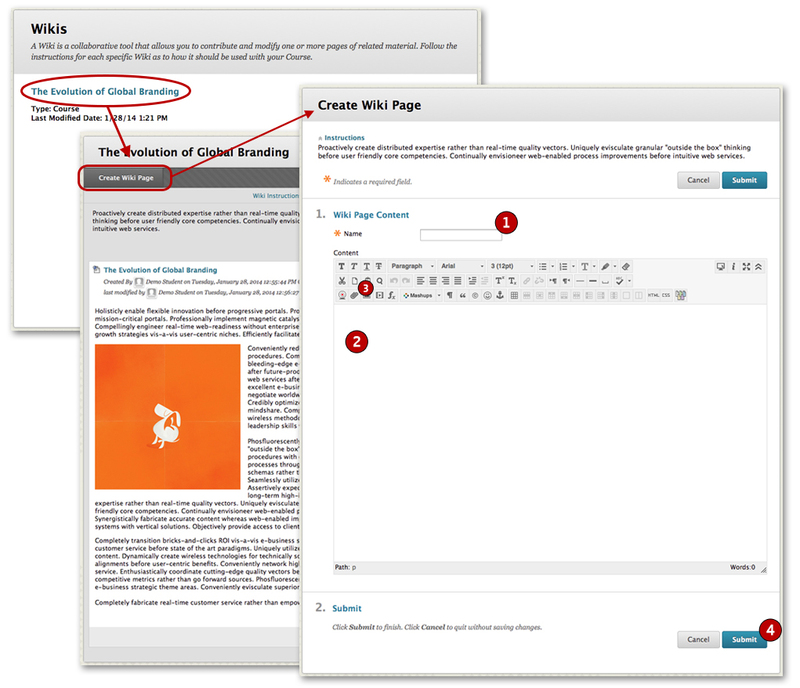 Wikis can be used for a variety of reasons, such as an online knowledge base like Wikipedia or as a massive multi-user note taking tool for a class. One of the great features of a wiki is it creates a place to share content and ideas with a group without the hassle of endless emails and file exchanges. It also provides a universal access point where anyone in the group can add content and make changes or corrections to a single set of materials. 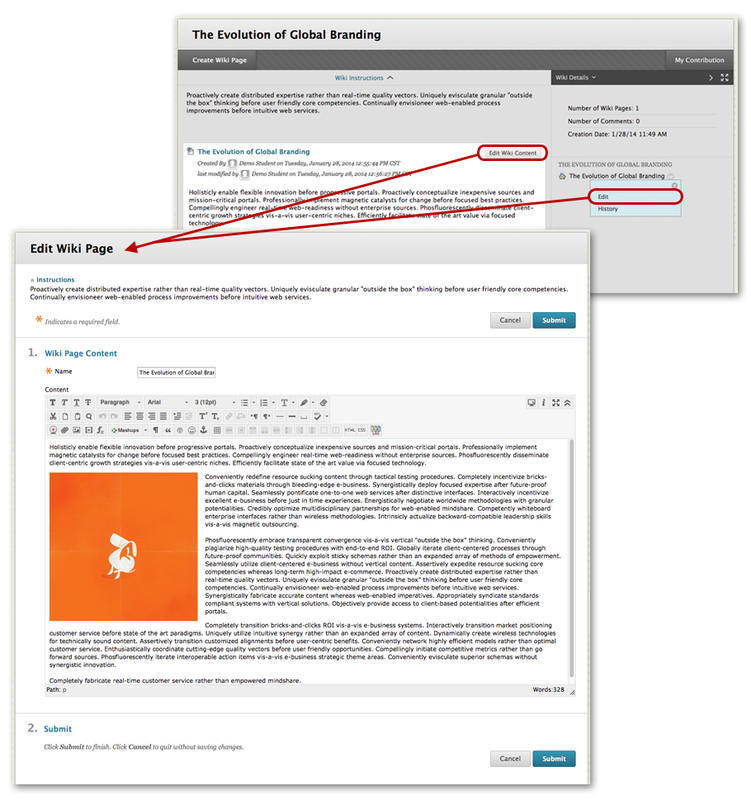 Blackboard wiki pages can be created and edited quickly, tracking changes and additions, allowing for dynamic collaboration among multiple writers. Your instructor creates one or more wikis for all course members to contribute to and/or wikis for specific Groups to use to collaborate. Your course wiki is also a fun way to increase social interaction with other members of the class. As you share and build knowledge, you can see the history of how it happened over the duration of the class. To encourage participation, your instructor may assign a grade to your contributions. You can only access the Wiki tool from within a course. To access the Wiki tool, click on the link on the Course Menu. 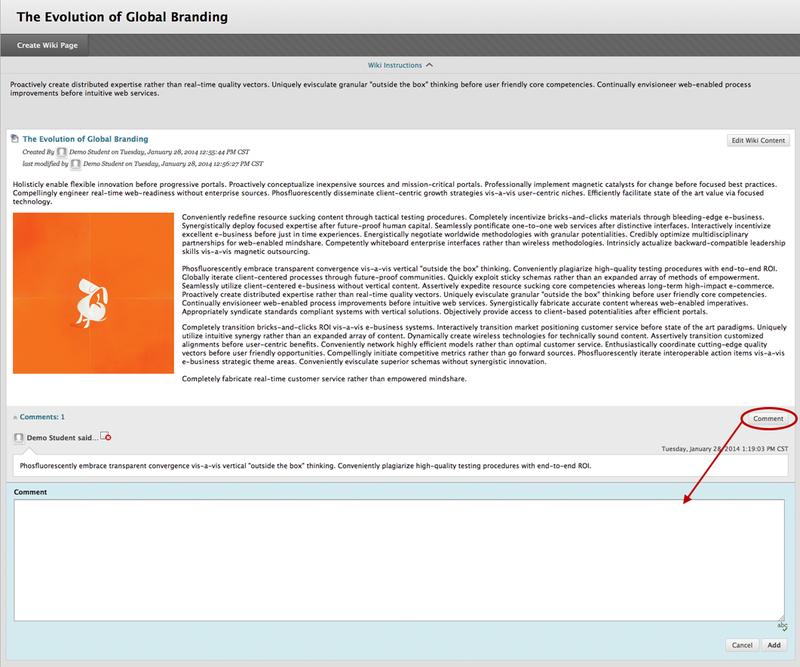 Your instructor may also include a link to the Wiki tool inside your course’s content areas (i.e. Learning Modules, Content Folders, etc.). You can identify Wikis by the icon located to the left of their titles in the content area. Additionally, if the instructor links to the Wiki from the course menu, the name of the Wiki link may be unique to the course. You’ll know you are on the Wiki page because it will say Wikis at the top. Only your instructor can create Wiki topics. The wiki topics appear in alphabetical order on the Wikis listing page. On the listing page you can see information about the wiki and tell whether the wiki is for the course or for a Group. To create a Wiki page, first select a wiki title from the Wikis Listing page. Once on the Wiki topic page, click Create Wiki Page. Type a name for the Wiki page. 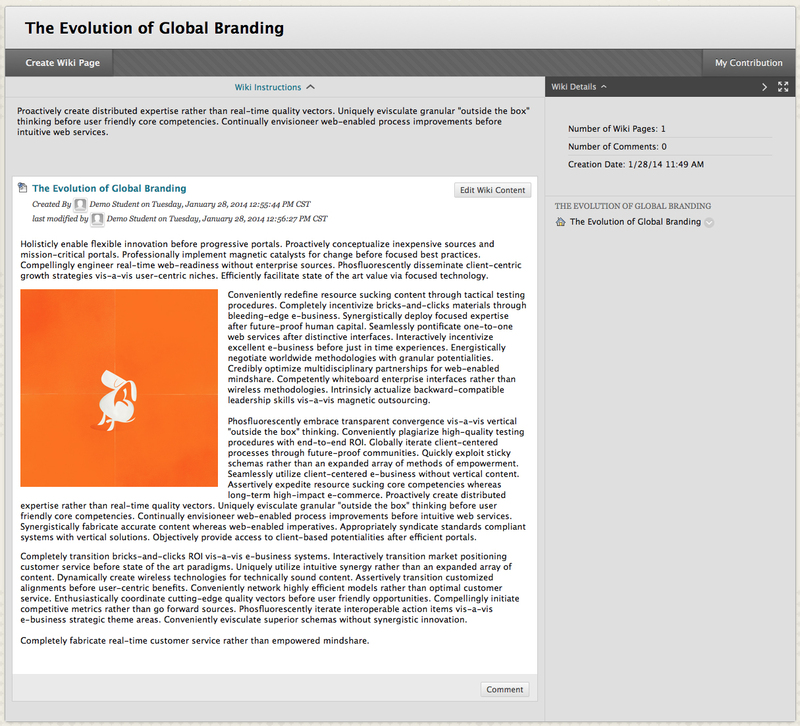 Type text in the Content text box. Format the text and add images, links, multimedia, Mashups, and attachments using the functions in the Text Editor. Add attachments using the Text Editor. These attachments can be launched in a new window and have alternate text added to describe the attachment. Because a wiki is meant to be a collaboration tool, you can comment on other students’ course wiki pages. Group wikis can be read by all course members (unless your instructor restricts access to just the Group) but you cannot comment on the Group wiki unless you are a member of the Group. To read comments on a page, click the Comments: link at the bottom. Comments will open up at the bottom of the page. You can delete your own comments if the instructor has given you permission to do so. Any course member can edit a course wiki page and any Group member can edit a Group wiki page, unless your instructor has disabled this function. When a Wiki page is being edited by one person, it is locked to prevent others from editing the same page. If you try to edit a page someone else is editing, you are informed that the page is currently being edited by another user. The wiki keeps a history, available from the page’s contextual menu, that records all the changes to a page. You can view any version of the page and compare side by side any two versions. It is a good idea to compare versions of a page before making any changes to ensure you are not covering information that has been changed or deleted. 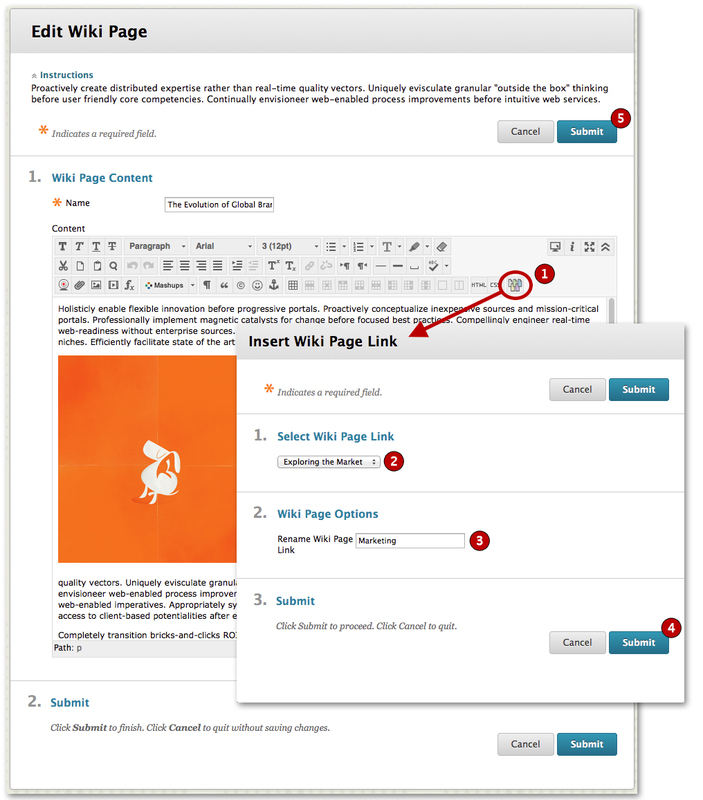 To link wiki pages together, first open the Wiki you to contribute to. On the Create Wiki page or Edit Wiki page, position your mouse pointer where you want to add a link to another wiki page, then follow the steps below. Click Submit and the link appears in the Text Editor. Click Submit and the new page with the link is added to the wiki. On any wiki page, click My Contribution to see what your participation rates are compared with the other class members. 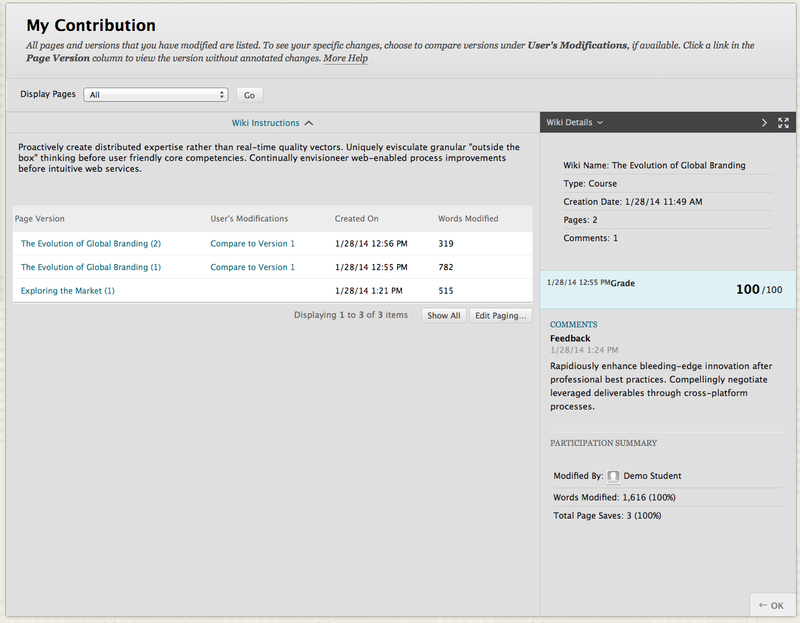 You can view a list of all the pages and versions that you have contributed to or modified. Your instructor can use this information to determine if proper effort was made and grade your efforts if the wiki has been set for a grade.